The Crowned Hawk-eagle is also known as the African Crowned Eagle. Scientists have discovered that it may take a pair of Crowned Hawk-eagles close to 5 months to build a nest from scratch. Scientists estimat that Crowned Hawk-eagles have an average life expectancy of only 14 years. 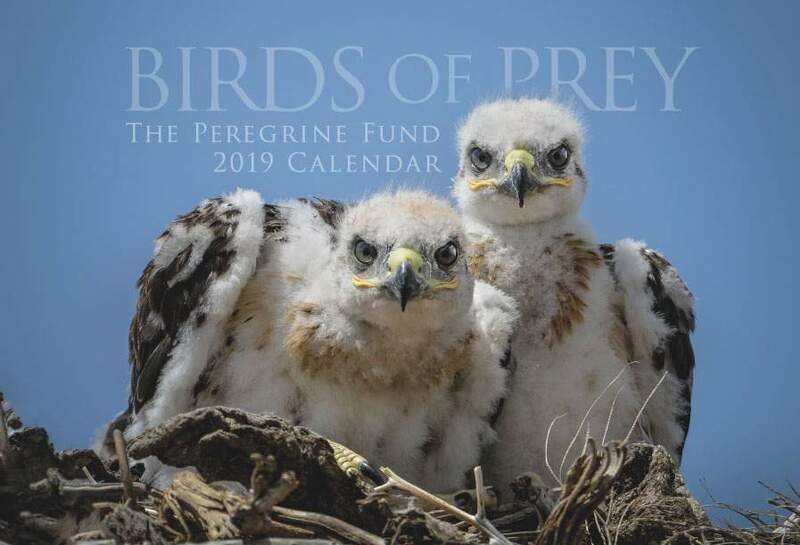 The Peregrine Fund has supported research on Crowned Hawk-eagle to learn more about nesting and dietary requirements of this powerful bird of prey. Additionally, it has been studying eagles and vultures in Kenya and other countries in Africa for decades. Conserving habitat for eagles and vultures automatically conserves Crowned Hawk-eagle habitat as well! Our efforts in this region also include providing environmental education, training students as biologists, and spreading the word about the importance of birds of prey by publishing articles in magazines and newspapers. All of this will help protect Crowned Hawk-egale as well as a host of other wildlife species in the regions where we work. The Crowned Hawk-eagle is found throughout Sub-saharan Africa including in Kenya, Ethiopia, Angola, Botswana and South Africa. The Crowned Hawk-eagle lives, hunts, flies over, perches, roosts and nests in a long list of different habitats including evergreen forest, dense woodland, forested ravines, gorges in open savannas, thornveld - which is a grassland dotted with acacia trees and other types of thorny plants - riparian woodlands, farm fields, montane forest, exotic tree plantations and other altered habitats. The Crowned Hawk-eagle is a diurnal raptor species, meaning it is active during the day and it is non-migratory - meaning it stays within the same area all year round. However, young birds do need to disperse from their parents' territories, sometimes traveling quite far. The Crowned Hawk-eagle is one of the most impressive-looking raptors in Africa! Adults are a mosaic of black, brown, white, rufous and coppery-colored highlights. They have dark crests, pale eyes, and black beaks. Their legs are completely feathered. Juvenile Crowned Hawk-eagles are overall white with light and dark grey feathers mixed in along their backs. Their tails are grey with dark bands. Though they live almost on opposite ends of the globe, the Crowned Hawk-eagle and the neotropical Harpy Eagle have something in common - namely their strength. The Harpy Eagle is considered to be the most powerful eagle in the world and the Crowned Hawk-eagle is the most powerful of all the African eagles. 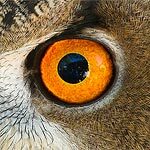 Even though the Crowned Hawk-eagle is a formidable hunter, this doesn't mean its hunting attempts aren't foiled from time to time, even by species that are normally perceived as weaker. If you had to guess who would win in a fight between a goose and a Crowned Hawk-eagle, most of us would guess that the eagle would win every time. And we would be wrong. One researcher observed a young Crowned Eagle attack a female Egyptian Goose while she was incubating eggs at her nest. However, the male goose was having none of that. He was able to chase off the eagle away after flying straight toward it and biting it! Sadly, the Crowned Hawk-eagle faces many threats to its survival. The largest threat it faces is loss of habitat. When trees are cut, forests are felled, and humans move in to areas where Crowned Hawk-eagles nest, roost or hunt, it becomes quite difficult for the species to find enough food, encounter good nesting sites, and remain safe from hunters. Sadly, people kill this eagle because they are afraid it will kill their livestock or domestic pets. Some humans also compete with this raptor for the same food, and sometimes people deliberately cut down its nest trees. One researcher even documented at least one group killing this eagle, in order to protect monkeys! However, what many people don't understand is that predators help maintain populations of their prey balanced and healthy. If you can believe it, the Crowned Hawk-eagle even faces some minimal threats from some of its prey! Monkeys and baboons being attacked by Crowned Hawk-eagle often fight back, biting and scratching at their attacker. Sometimes even entire troops will join in trying to rescue their troop members. Researchers have also observed several instances of primates, such as Olive Baboons and Gentle Monkeys, pulling sticks from Crowned Hawk-eagle nests to destroy them, or attacking and beating up eagles on the nest, causing them to fly away. It is suspected that the monkeys might eat Crowned Hawk-eagle eggs or young during these attacks. Imagine for a second what it would be like to be such a powerful bird that you could take down prey a lot heavier than you! What would you do? Where would you go? Well, the Crowned Hawk-eagle doesn't have to imagine it at all. The Crowned Hawk-eagle is strong enough to be able to kill an antelope up to six times its own mass! That is pretty impressive. But, despite its hunting prowress, it doesn't always need to take down such large prey. It also feeds on smaller animals including monkeys, such as Blue Monkeys and Vervain Monkeys, and other mammals, including small duikers and klipspringers, Rock Hyrax, and Sharpe's Grysbok. It also feeds on reptiles, such as Rock Monitor, and occasionally birds. But how is it that the Crowned Hawk-eagle is able to take down all of these different animals? The answer lies in its legs and feet! The Crowned Hawk-eagle uses its extremely strong tarsi (legs) and large talons to grip its prey and crush their skulls. The Crowned Hawk-eagle is one of the few living raptors that is believed to have occasionally taken human children as prey. 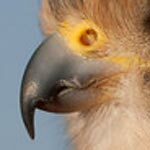 The Crowned-hawk Eagle has one of the longest breeding periods of all the eagles in Africa. It starts as most breeding attemps start - with courtship. In the case of this species, both females and males participate in beautiful displays at this time of the year, though the male a bit more often than the female. The courthsip flights involve a series of artful displays wherein the individual climbs high up into the sky, flapping a few times, then hurtling toward earth in an elegant dive, before swooping up again. Usually the individual doing the display calls often, setting its own "soundtrack" to this aerial dance. Sometimes the pair will engage in aerial displays together, soaring side by side, clutching talons, and falling in circles toward the earth. These activities strengthen the pair bond and signal that breeding season is close at hand. When the pair is ready, they will both work together to build their large stick nest. The female often takes on the job of finding appropriate nesting materials and bringing them to the nest site, while the male does a lof the work constructing and arranging the nest just so. They build their nest often in the highest trees in the forest, and more rarely on cliff faces. Crowned Hawk-eagles build one of the largest of the eagle nests in Africa, sometimes using the same nest over and over again for several years in a row. After years and years of use, repair and adding new materials, a Crowned Hawk-eagle nest can measure close to 10 feet (3 m) deep and 8 feet (2.5 m) across. Once the nest is built, it is time for the female to lay her eggs. The Crowned Hawk-eagle usually lays between 1 and 2 eggs. Once the eggs are laid, the female is responsible for most of the incubation, while the male works hard to feed himself and the female. After the eggs hatch, both the male and female may hunt in order to feed their growing young. Despite this, in most cases, only one chick will survive if both eggs hatch. The second chick may die for two reasons: 1) it gets less food and eventually weakens and dies or 2) its older, stronger sibling kills it on purpose. After several months of receiving sufficient food and protection from its parents, and after most of its feathers have grown in to replace the down which covered it at hatching, the young eaglet will be ready to fledge, or fly for the first time, at around 100-110 days of age. Before its first flight, this eaglet will begin exercising its muscles by flapping its wings vigorously while still in the nest. It will then begin to branch out - which sounds like exactly what it is! The young eagle begins to walk on the branches around the nest, hopping from limb to limb, gaining the strength and confidence it needs to make its first flight. After the young fledges, it will remain dependent on its parents for another 11-12 months before it is ready to disperse out of its parents territory. It must survive for another 4 years before it will reach sexual maturity and be able to raise young of its own.